Instill your space with clean, modern lines. Experience new textures. Update your aesthetic and energize your environment. The interior design experts at Graber invite you to consider the following fresh, chic, modern possibilities for 2017. Then, transform your space. With a unifying palette of soothing colors, traditional and contemporary elements easily blend to create a relaxed retreat. Your Own Brand of Calm. Cover a downy soft pillow with a classic white linen case. Pile a chunky beige throw on the bed, adding the loft and warmth of a cable knit sweater. 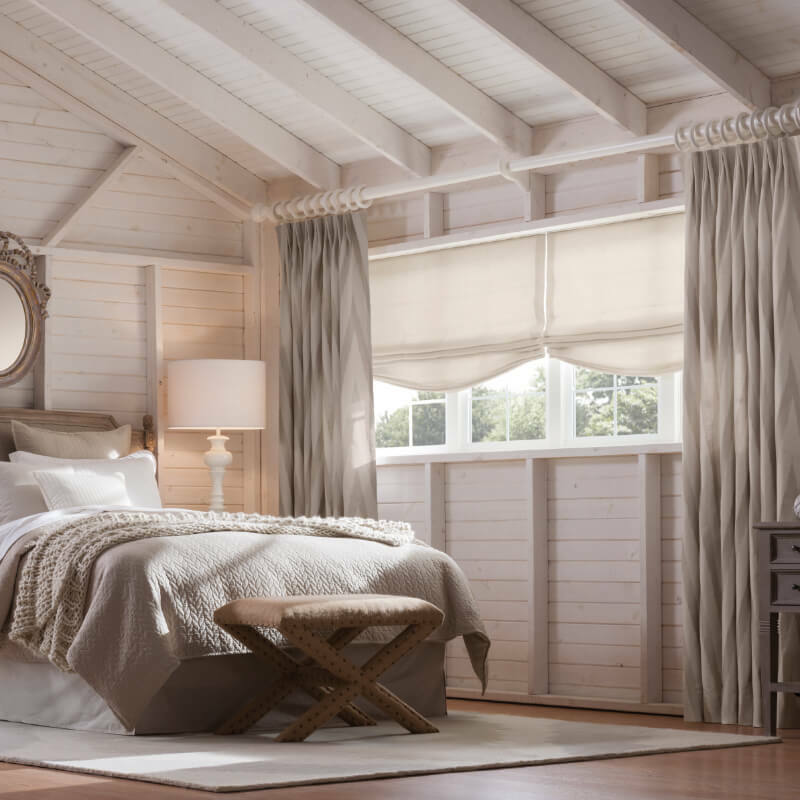 Layer large patterned drapes with a translucent Roman shade in creamy neutrals. Elevate monochromatic design with your own distinctive style. Choosing room accents that use a spectrum of color, like a multifaceted piece of art, can work with a variety of looks to tell the story that inspires you right now. Design to Taste. 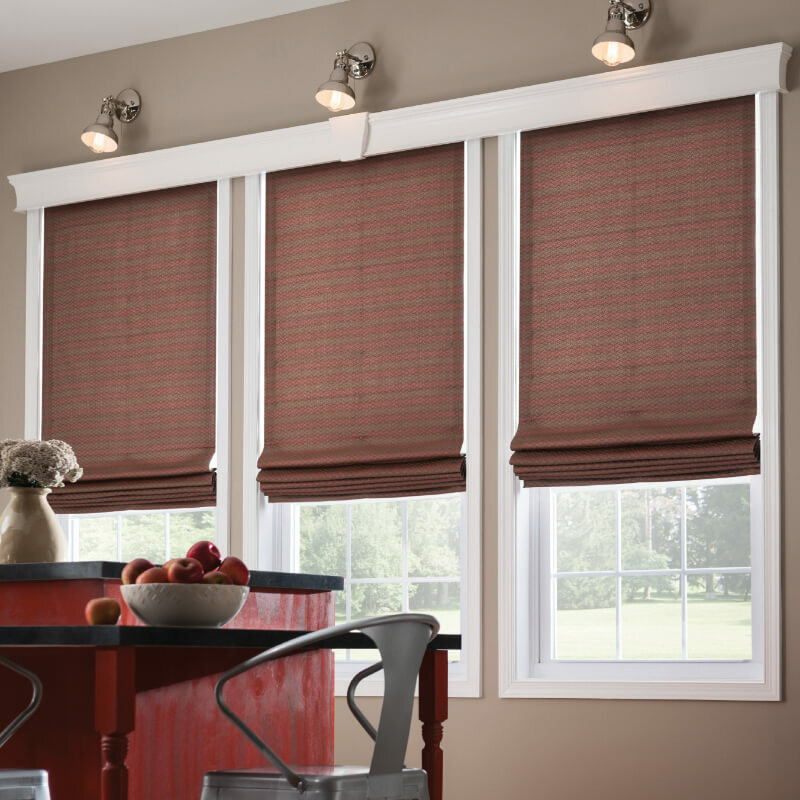 At a distance there is an ombre stripe in these tailored Roman shades, in graduated colors from tomato to smoked paprika, chili powder to cumin. Up close, the fabric reveals a complex, micro-geometric pattern of diamonds and checks that plays with light and dark, matte and sheen, bright and muted tones. That complexity allows you to explore multiple color schemes. Handcrafted furniture and décor will always be valued for their individual character and workmanship. Likewise, your home is made richer by your unique finds at flea markets and antiques stores and the distinct stories they tell. New Combinations for Traditional Spaces. Welcome guests to the dining room with eclectic collections of new and vintage accents. Juxtapose metallics softened by age with budding, natural greenery. 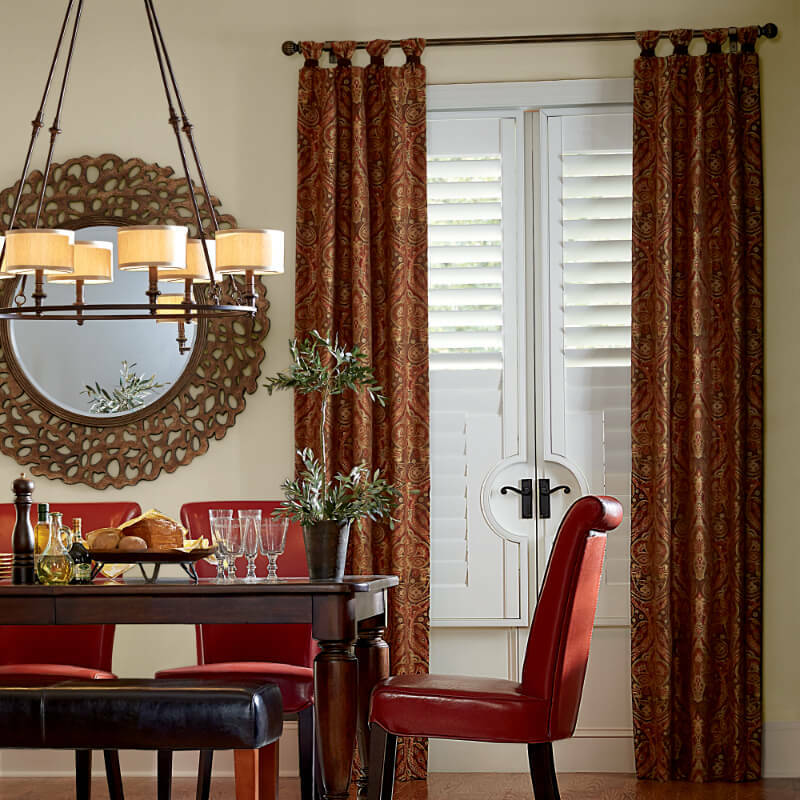 A warm color palette of burnt orange, bronze, and rust unites the room, even as the exotic pattern and flowing fabric of the drapery panels contrast with the neutral color and traditional lines of classic shutters. Surround yourself with objects you love and create your own unique chic. Here amethyst, sage, and gold in fabrics, glass, and abstract oil paintings are offset by the gleaming finish of brass in light fixtures, end tables, and three-dimensional art. Color in New Proportions. Using blocks of color in design has evolved. More than combining two wide swaths of contrasting fabric, it has expanded into stripes and complementary jewel tones; an expression of bright, bold living. Bring your own sense of color, proportion, and intensity to your windows through these new textiles. Classic stripes are always in, but it’s up to you to choose the combination of width, weave, tone, and texture that keep your room cohesive—and captivating. Reveal Clean Lines. Let your favorite heirloom or your latest find shine. Clear away the clutter to focus on one meaningful accent, highlighted by the strong lines of clean surfaces. Light and Dark. Solar shades soften and diffuse the light, creating ambiance while protecting artwork, carpeting, wood finishes, and furniture from damaging UV rays. 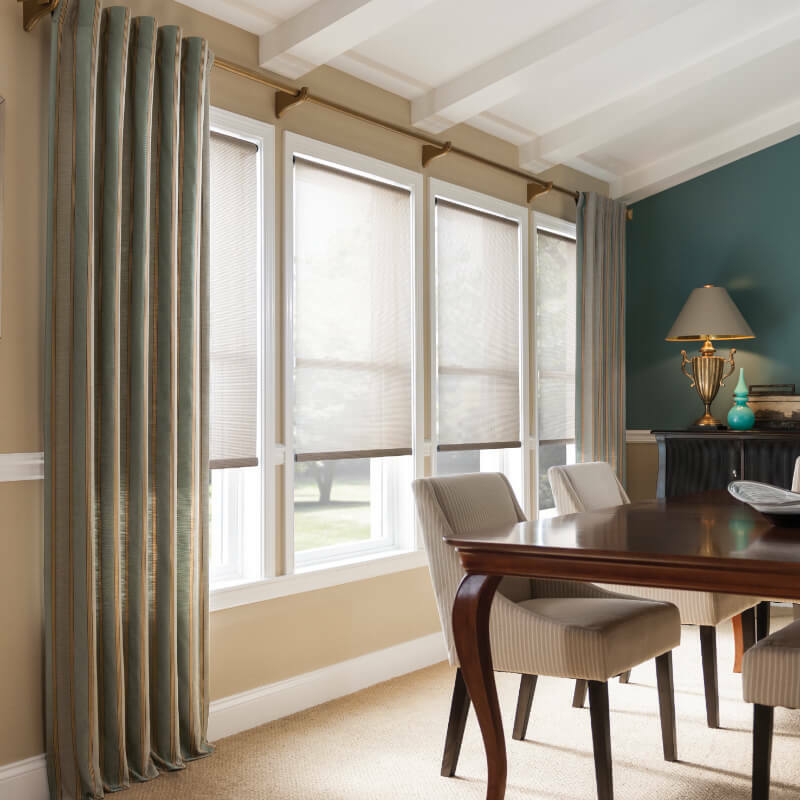 Pair these translucent neutral shades with rich, vivid, jewel-toned drapes and give your windows the same dramatic contrast that enlivens this dining space.